PLAINVILLE - Plainville got an impressive debut performance by freshman goaltender Brennan Staubley as he produced a clean sheet in a 2-0 victory over Bristol Central in the season opener for both teams Friday afternoon. Staubley made five saves on the day. Plainville got both of its goals on free kicks, one by Jacob Pierce and the other by Mike Torres. 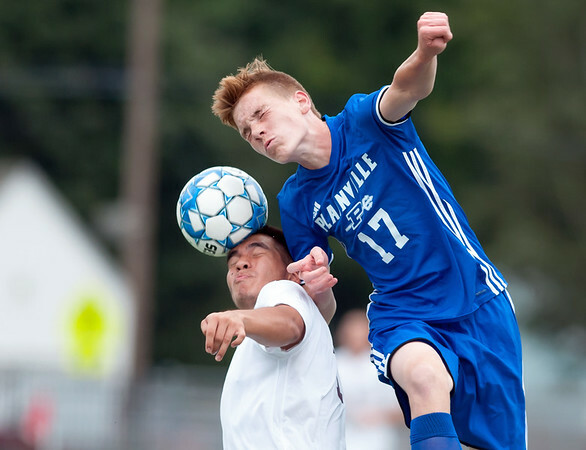 The Blue Devils outshot Bristol Central 7-4, but the Rams held the edge in corner kicks, 5-4. Southington 1, Conard 0: The Blue Knights got a second half goal from Chris Chaplinsky to win their season opener at home. Marek Kryzanski assisted on the play. Goalkeeper John Griffin made 10 saves for Southington (1-0), while Mike Costello stopped four shots for Conard (0-1). Innovation 4, Hale Ray 3: Malena Van Beveren created a penalty kick opportunity with under 10 minutes to play and the game tied at three and then converted for the game-winner as Innovation took home a victory in its season opener. Van Beveren scored a hat trick for the host Ravens. Melinda Knopf had a goal and an assists, while Ariana Rivas made seven saves in a winning effort for Innovation. Carly Houle scored three goals for Hale Ray. Southington 1, Conard 0: Natalie Verderame scored the lone goal to push the Blue Knights past the Chieftans. Verderame’s goal was assisted by Allison Carr in the second half of the game. Southington goalie Olivia Sherwood had five saves on the evening. Berlin 9, Platt 0: The Redcoats opened up their season exactly how they wanted too, on a high note. Berlin had four different scorers, with sophomore Ashley Wenzel leading the team with four goals. Maxine Muscatello added one goal and two assists while Taylor Edman also added one goal and two assists. The last goal was scored by Sarah Bellizzi and goalkeeper Lindsey Walsh made one save on the evening. Newington 3, New Britain 0: The Indians won in New Britain to open the new season, sweeping the Hurricanes 25-15, 25-22, 25-17. For New Britain, Raven Jarrett had eight kills and 12 digs, Amanda Jacobs had 12 digs and Angie Lugo had 10 service points and 10 digs. For Newington, Maddie Massaro-Cook had seven kills and Alaysiah Hall had 13 digs and three aces. Innovation 3, Goodwin Tech 0: The Ravens won their season opener at Goodwin Tech in straight sets, 25-19, 25-22, 25-9. For Innovation (1-0), Molly Corcoran had 17 assists, Morgan Sartor had three aces and seven digs and Aaliyah Walker had six kills. Goodwin Tech (0-1) was led by Joa Pino (3 kills, 2 aces, 4 service points), Ada Guzman (4 service points, 1 kill, 2 digs), Tiana Rodriguez (3 service points, 1 kill, 5 assists), Korina Traminell (1 ace, 4 service points). Newington 1, New Britain 0: The Indians sole goal was scored by Louis Egbuna and was assisted by Trey Sadler. Newington took 16 shots on goal and goalkeeper Jack DeGirolamo collected three saves. New Britain took for shots on goal and the Hurricanes’ goalkeeper Adam Gottner finished the night with 12 saves. Posted in New Britain Herald, Berlin, Goodwin Tech, Innovation, New Britain, Plainville, Southington on Friday, 7 September 2018 21:56. Updated: Friday, 7 September 2018 23:37.